These sugary sticks are just the bee’s knees. Make a large stash of them to have on hand for visitors, or package them up neatly and present them as gifts. This fabulous recipe (see below) comes from the gorgeous book Sweet Things by Annie Rigg. 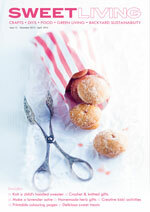 If there’s one book on making sweets to buy this year – this is it. 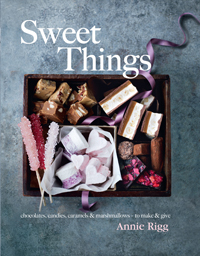 Chocolates, marshmallows, Turkish delight, fruit pastilles, toffees, fudge, caramels, nougat, brittle, honeycomb, candy canes, lollipops – everything you could possibly want to make is in this book. Mmmm. We love it. If you have a natural gravitational pull towards sweet shops and chocolatiers, you’ll love it too. Recipe extracted with permission from Sweet Things: Chocolates, candies, caramels & marshmallows – to make & give by Annie Rigg, photography by Tara Fisher. Published by Kyle Books and distributed in New Zealand by New Holland, $45.00. For this recipe, sugar-crusted bamboo skewers are suspended in a jar of saturated sugar solution and the sugar crystals then form around the stick to create a rather beautiful, sculptural treat. Don’t be tempted to disturb the candy sticks until they have formed large crystals, as pictured – this can take anything up to two weeks (or maybe even longer in cooler climates). These are not for the impatient among us, but the results are so satisfyingly beautiful that they make the wait more than worth it. If you are planning on making these crystals for a specific occasion, I would suggest starting well in advance of the date, as they will keep for months. Candy Sticks will keep for months in an airtight box in a cool, dry place. Take 6 of the skewers and dip into a glass of cold water so that the water comes 8–10cm up the skewers. Tip 100g of the sugar on to a baking tray and roll the wet end of each skewer in the sugar to coat evenly. Stand, sugared end uppermost (taking care not to knock any sugar off) in an empty glass for about 2 hours to dry. Tip the remaining 600g sugar and 250ml water into a saucepan and, over a low to medium heat, gently stir to completely dissolve the sugar. Bring to the boil and simmer gently for 2–3 minutes until very slightly thickened and syrupy. Add enough food-colouring paste to the syrup to make a good, strong colour, stir well and divide between the jam jars. Leave the syrup to cool for about 1 hour. Lay 2 clean wooden skewers across the top of each jar in a parallel line roughly 2–3cm apart. Clamp a clothes peg or food-bag clip on to each of the sugar-coated skewers roughly halfway up, being careful not to knock off any of the dried sugar. Sink the sugared end of the skewers into the syrup and adjust the height of the clothes peg so that the sugar skewer hovers, suspended, roughly 1cm from the bottom of the jar. Then rest the peg astride the parallel skewers. Repeat with the remaining sugar skewers, so that you have 3 per jar and each skewer is spaced well apart. Leave the jars undisturbed in a warm, dry place (a sunny windowsill is perfect) for at least 1 week, until large sugar crystals have formed around the submerged skewers. The timings of the crystal formation will vary depending on the room temperature and light and can take up to 3 weeks in cooler climates. Carefully remove the skewers from the jars, allowing the excess syrup to drip back into the jar. A layer of sugar-crystal crust may have formed on the top of the jars so be careful not to knock any crystals off your skewers as you extract them from the jar. Leave the skewers, suspended crystal-end downwards over a glass to dry for at least 1 hour.